Apples are in season now, so it's a great time to make some French apple pie. Autumn is apple season, so apples are prevalent in the produce section and local farmer's markets in various and interesting forms. But with so many apple varieties available, how do you know which ones to buy for cooking and which ones are best eaten out of hand? A good rule of thumb is the firmer the apple, the better it is for cooking. Avoid the "Delicious" variety and look for Jonathans, Winesaps, Roman Beauties, or the good old stand-by Granny Smith. You will find these apples to be firm, juicy, and tart. The tartness is really important when cooking with apples because most apple recipes call for a lot of sugar. The tartness of the apple will give the recipe a good balance. If you use a sweet apple, the flavor of the apple will get lost in the seasonings. So an apple with some attitude (Appletude?) is your best bet. For this French apple pie recipe, I prefer to use Winesaps. What Can Top an Apple Pie? A great French apple pie needs a great topping. Usually, they are topped with plain crumb topping, but I like to go a bit further with the recipe. 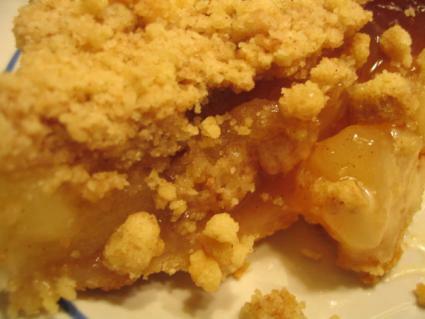 The basic crumb topping for French apple pie is flour, sugar, and butter. This is nice and easy, but it's boring. When I make my topping, I go just a little bit further and add a bit more flavor. Crumb topping might look hard, but after you've made it once you will see that it's easy as pie. I suggest that you make the topping ahead of time just to get it out of the way and so it's ready for your pie when your pie is ready to cook. There is no hard and fast rule here...if you want to do the topping last, that's okay, too. This recipe does not call for a top crust. Any piecrust recipe you like will work or if you want you can use a pre-made piecrust bought from the store. Place the flour, butter, baking powder, sugar, salt, and ginger in a food processor. Slowly add the cream in small amounts while pulsing the food processor. Stop adding the cream when the topping clings together when you pinch some of it together. The topping needs to be a bit dry. Bake at 425 degrees Fahrenheit for 40 minutes. Remove from oven and top with the crumb topping.